It's funny to think that a few days ago I thought we would be picking up the mess from the storm but instead we are enjoying of blue skies and shining sun... So today, I'd like to sen d some of it to those people who are on the path on the storm and wish them that nothing bad happens... Stay safe my friends!!! I wanted to remind everyone that this year I'd also love to receive postcards from you to add to my collection. This one was sent by Lena from La Petite Coquin and this year to celebrate my birthday she is sending me another... You are the best! If you want to be part of the celebration leading to my birthday next month EMAIL me and I'll send you my address... all postcards will be posted here! Now here are the week's links! what an awesome idea! i love this pretty postcard! have a great weekend!! Love Lena and I love that she sent you a postcard. Have a wonderful day! sending the birthday postcard is so sweet. i'll be in florida next week so i hope all the rain will be totally gone by then! Seeing that postcard made me GRIN-I'm so excited to send another! Have a wonderful weekend, darling! We are FULL of sunshine here in Arizona but my daughter is in DC finishing up her summer there and this momma bird is a little worried. We're right in the path, so that postcard may be delayed but I will get it out soon! Sorry for any delay! Have a great weekend! That is so sweet and such a creative idea! I am glad you have blue skies and sunshine today! May you continue to keep safe! so you are out of danger now??? I hope so!! Yay I love postcards, how fun! glad the storm didn't hit you! and how fun to get postcards! i love this idea. i should totally send you one too! the postcard is so cute! i used to collect them but havent added to my collection in a long time... i should restart collecting again! 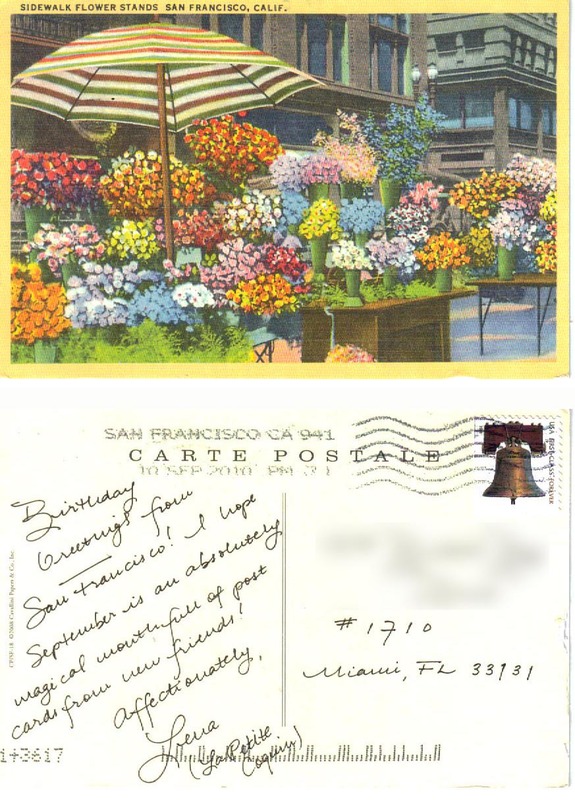 Love all the flowers in that postcard. So sweet and pretty! She is SO incredibly sweet! I love this! What a wonderful idea. I will totally send you a post card if you want. Glad to hear you are having nice weather. It has been perfect here too. My heart goes out to everyone who had to and are still dealing with the damage caused by Hurrican Irene. I'm so glad it didn't hit you guys. So scary all these natural disasters!